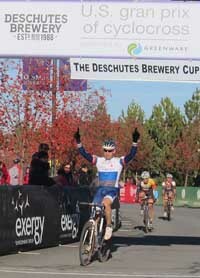 Ketchum’s Richard Feldman crosses the finish line at Bend, Ore. Dec. 11. There he secured the season championship of the Exergy U.S. Gran Prix of Cyclocross. On Dec. 11, while skiers were screaming down Baldy's slopes, Ketchum resident Richard Feldman, 42, of Durance-Colnago was racing in the finals of the U.S. Gran Prix of Cyclocross series at Bend, Ore.
Not only did Feldman earn a couple of third places at Bend, he captured the overall season championship of the Master Men's 35-plus class by a 90-point margin over runner-up Mark Savery of Lincoln, Neb. Feldman picked up points in all eight races and finished with 286 points, to Savery's 196. Last year, Feldman placed fifth in the Masters 35-plus class on the U.S. Gran Prix tour. The Exergy U.S. Grand Prix of Cyclocross is the premier cyclocross series in the country. The 2011 circuit consisted of eight races in four venues, over four months this fall. They were The Planet Bike Cup Sept. 24-25 at Sun Prairie (Madison), Wisc. ; The New Belgium Cup Oct. 8-9 at Fort Collins, Colo.; The Derby City Cup Nov. 12-13 at Louisville, Ky.; and The Deschutes Brewery Cup Dec. 10-11 at Bend. With one first place for 50 points, three seconds for 40 points each finish, three thirds for 34 points each finish, and a ninth place for 14 points, Feldman handily won the series. His victory, by a full 41 seconds, came in the Sunday event Sept. 25 in Wisconsin. Feldman's ninth place came in the first race Oct. 8 at Fort Collins. He encountered mechanical problems at the start. He said, "The whole field shot away from me, and I was there, on the start line working on my bike. It was the equivalent of giving your closest competitors a 22-second head start. It was good training, but I generally don't like to have to pass 70 riders on a muddy course." Feldman bounced back with a third place in Sunday's Fort Collins race and was on his way to the overall season title. Cyclocross is a fall/winter, on-road/off-road cycling discipline held on a looped circuit of approximately 1-2 miles. A cyclocross bike splits the difference between a road bike and a mountain bike. It has knobby skinny tires, drop handlebars and a lightweight frame. Racers navigate mud, sand, pavement, grass, gravel, pasture and mulch. When terrain is too steep to ride or they're confronted by a set of wooden barriers, the riders dismount, shoulder their bikes and run. Race regulations suggest a lap be comprised of 90% riding and 10% running. Each race is a timed event lasting anywhere from 40 to 60 minutes depending on a racer's category. The race leader at the end of the last lap is declared the winner. The sport originated in Europe after the second World War where road cyclists began riding in pastures and muddy fields to maintain their fitness. The first World Championship was held in Paris in 1950. Cyclocross enjoys a strong following in continental Europe and is currently the fastest growing cycling discipline in the U.S. The Union Cycliste Internationale (UCI) governing body has targeted the U.S. as a key market for the expansion and continued growth of the sport. In 2013 the organizers of the U.S. Gran Prix will produce the UCI Elite Cyclocross World Championships at Louisville. It represents an historic first—the first time the World Championships have been held outside of Europe in the event's 60-plus year annals. Louisville will also host the 2012 and 2013 Masters Worlds Championships.